The internet can be a weird place. It is like a huge sandbox the size of the entire human existence and then some. People can find community, solace, and a voice through the web. Today, I received a letter. It was hand-typed on gorgeous sepia paper. Its message was simple: Keep doing what you’re doing. 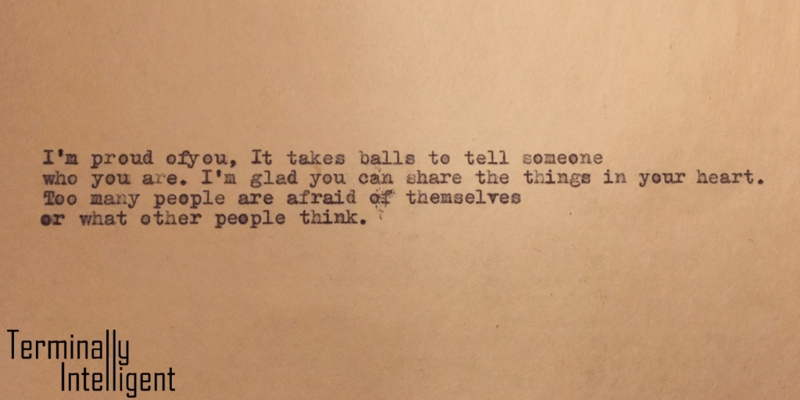 I’m proud of you, it takes balls to tell someone who you are. I’m glad you can share the things in your heart. Too many people are afraid of themselves or what other people think. These words rang true as soon as my eyes hit the page. I am humbled and honored. There is only one way I can honor this letter sufficiently, and that is to keep going. Subscribe and like Terminally Intelligent on Facebook to keep up with the awesome content due to hit the screen soon. Fall is a season full of difficult and strange memories for me, and I’d like to invite you to join me while I ride it out. Look forward to tomorrow’s Sunday Top 10. I’ll see you in the morning. If only I were as brave as Rory. He has inspired me to go this far. For that, I thank him immensely. My dear friend. You are braver than most, and kinder than many more. We’ll both keep it up, yeah? Hugs.